I am still obsessed with the citrus salad I wrote about in January. Perhaps it is because winter still has an icy grip on my shivering shoulders. Or, maybe I'm addicted to grapefruit not only for its bright, juicy, flavor, but because pamplemousse is my favorite French word. It just makes me happy to utter it while dissecting a grapefruit. 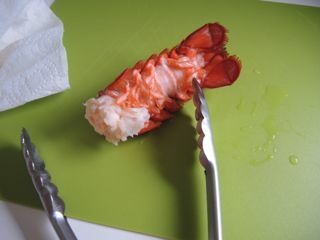 So, when I was in the grocery store recently and noticed lobster tails on sale I thought, "Why not?" 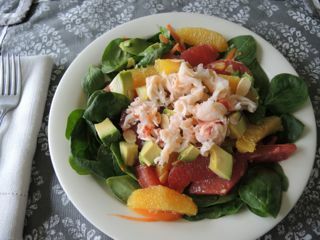 Adding a little seafood to this salad elevates it from salad to meal - a sublime meal at that. 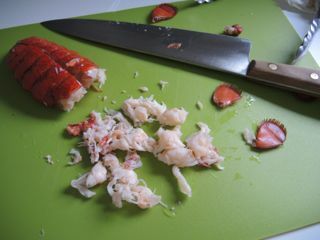 Crab meat or shrimp would be suitable substitutes, but lobster brings it to a whole new level. You can play with the ingredients, but the real key is the pamplemousse, avocado, and lobster. The rich lobster, tart grapefruit, and creamy avocado make a perfect combination. It seems so indulgent and it is. Oh, but it is so good. 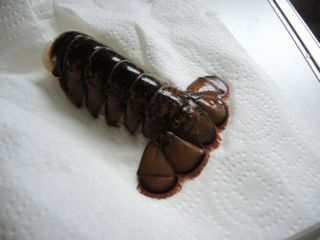 Gently boil the tail a few minutes to cook the meat. This tail took about five minutes. Allow it to cool a few minutes. Remove the meat from the tail. Cut into pieces. 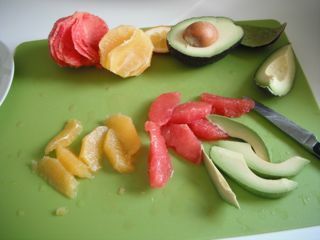 Section oranges, grapefruit, and avocado and voila. 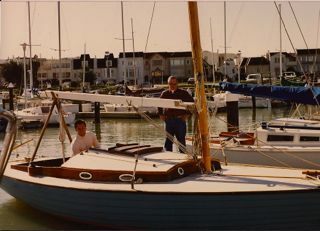 When Chris and I lived in Palo Alto, we had the good fortune to have a small sailboat moored at Gashouse Cove Marina in San Francisco. She was a Danish Folkboat named Amber because she first sailed in the Baltic Sea. Every inch of Amber was wood. Our free time was precious, so we often faced the dilemma - sand or sail? Work or play? When we were sailing, we felt guilty we weren’t sanding. When we were sanding, we wished we were sailing. Finding the right balance was often the challenge. Water, especially salt water, is very hard on a boat, without continual maintenance there would be nothing left to sail. However, if you only work on the boat and never get to enjoy sailing her there is no point in having her. In the word's of my mother - everything in moderation. I created this blog because I love to bake, cook, write, and take photos, and I wanted to share the story of our kitchen remodel. For me the creative part is play, however blog maintenance is work. It is no secret I am technologically impaired. I have been on a steep learning curve from the beginning. A month or so went by before I realized the comment section didn’t work. I have been trying to fix it ever since. After a lot of trial and error and much frustration, I think it now works correctly. You do have to enter a name and a valid email address, however, only the name will appear. The email address will not and it will not be shared or used in any way. So, even though I’m late to the party, if you want to comment on a previous post, please feel free. I promise to read all comments - even if they go back to the beginning. I do apologize that the comment section wasn’t working all along. I don't know what became of Amber. The man who bought her did so for the berth. 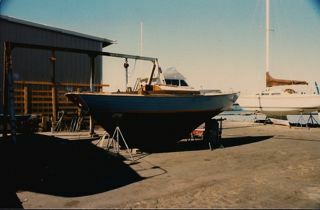 He planned to replace Amber with his own boat and put her in dry-dock. I do hope he eventually found a new owner for her and that she is still lovingly cared for and enjoyed. Although she would be nearing 70 years old, I would imagine she still has many good years of sailing left, if she is both sanded and sailed. After all moderation is the key. Over the years I have subscribed to just about every food magazine ever published. What I have to show for it is two large binders full of torn out recipes, plus a couple of over-flowing file folders. I haven't begun to make each and every recipe, but I have made a lot of them. 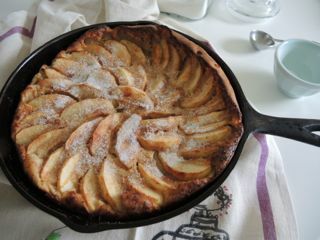 Especially this recipe for an oven-baked apple pancake. I couldn't tell you which magazine it came from, but if I had to guess I would say either Gourmet or Food & Wine, probably from the mid-1990s. It may be a recipe that has been around the block a few times, but it combines two foods that are favorites in our household: apples and pancakes. My children often request it for breakfast, but any left-overs make a lovely afternoon snack. 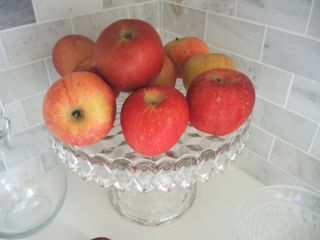 In the summer I substitute peaches or nectarines and pears are a nice change in autumn. I have made the pancake with many different kinds of apples including: Golden Delicious, Fuji, Honey Crisp, Pink Lady, and Macintosh. All with good results. For this post I used Fuji. Use whatever fruit you enjoy. Generously butter a well-seasoned iron skillet. Sift dry ingredients into a bowl. Mix wet ingredients in another bowl and add to the dry ingredients. Mix well. 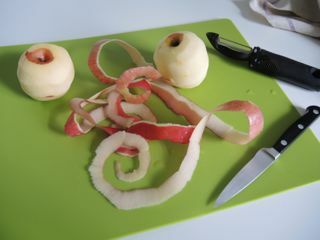 Peel, core, and thinly slice apples. Toss with cinnamon and sugar. Arrange in a circular pattern on top of batter. Preheat oven to 425℉ (218℃). 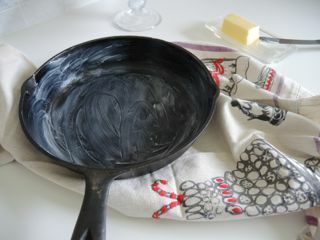 Generously butter a 10-inch cast-iron skillet. Sift flour, 1 tablespoon of sugar, and salt in a large bowl. Whisk eggs, milk, melted butter, vanilla, and 1/4 teaspoon cinnamon in another bowl. 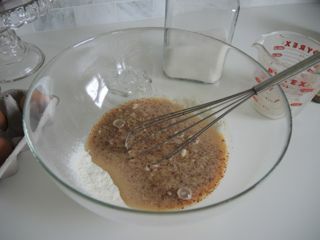 Add to dry ingredients and whisk to combine. Mix1 tablespoon of sugar and 1/4 teaspoon of cinnamon in a bowl large enough to hold the apple slices. Peel, core, and thinly slice apples and toss with the cinnamon sugar mixture. 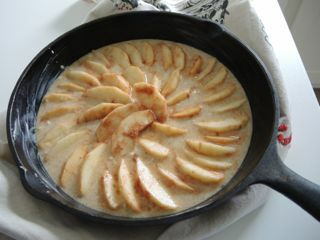 Pour batter in skillet and arrange apple slices on top. Bake for 20 minutes then reduce oven temperature to 350℉ (175℃) and bake an additional 5-10 minutes until center is set and the edges are puffed. Sprinkle with final tablespoon of sugar and serve. Chocolate or vanilla? Which flavor are we in the mood for is often the question in our household. Personally, I'm always in the mood for chocolate, but my children often opt for vanilla. So what to do to keep us happy. Maddie solved the dilemma by choosing a black and white cheesecake for her birthday cake. It satisfied our chocolate craving and our need for vanilla, keeping the dessert harmony in perfect balance. Harmony is a good thing. It keeps everything in balance. My parents recently celebrated their 56th wedding anniversary. Yes, that is correct, 56 years. They are a beautiful example of wedded bliss. An amazing accomplishment. When asked the secret to a harmonious marriage their response was - love and forgive. Stellar advice. 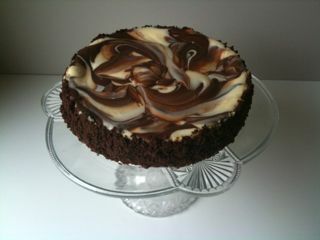 This cheesecake is a nice balance between chocolate and vanilla. The texture is ultra-creamy and the chocolate pastry adds just the right amount of crunch to accomplish perfect dessert harmony. Whether you are a chocolate addict or a vanilla lover, are celebrating a birthday, an anniversary, or nothing at all this cheesecake is sure to please everyone. Process butter, sugar, vanilla and salt in a food processor until blended. Add cocoa powder and process until smooth. Only pulse the processor a few times once the flour is added to make a dough that is crumbly. Bake crust in a springform pan until set. Allow cream cheese to soften before using. 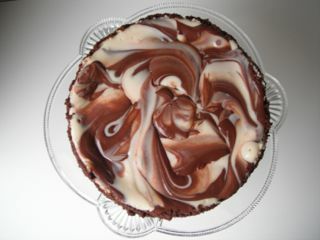 Don't over-beat cream cheese and sugar or it will become too thin and the cheesecake won't have a creamy texture. Leave defined areas of chocolate and vanilla batter. Preheat oven to 350℉ (175℃). Combine butter, sugar, vanilla, and salt in a food processor and process until creamy. 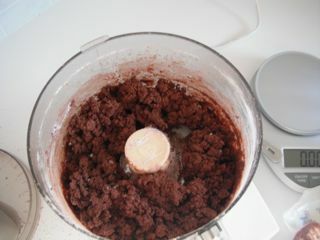 Add cocoa powder and process until mixture is a smooth paste. Add flour and pulse just until crumbly. Press 3/4 of the mixture into the bottom of an 8-inch (20-cm) springform pan with a removable bottom. Toss the rest of the crumbs loosely on a baking sheet. Bake bottom crust and loose crumbs for 10 minutes. Remove the baked crumbs, but continue baking the bottom crust another 5 minutes. Cool both on a rake. When the loose crumbs are cool pulverize in a food processor until fine crumbs. Cover and set aside. Reduce oven temperature to 325℉ (160℃). Butter the sides of the springform pan above the cooled crumb base. Put chocolate and water in small bowl. Melt over simmering water or in microwave on 50% power until smooth. Keep warm. Beat cream cheese in mixer with a paddle attachment. 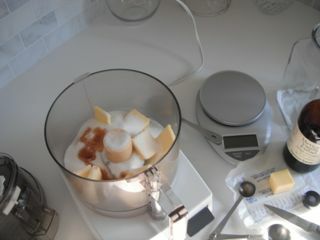 Gradually add sugar, beat just until smooth. Scrap down bowl and paddle a few times. 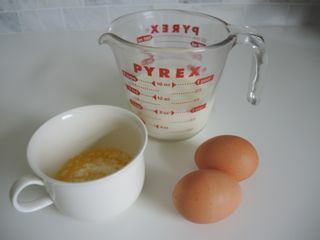 Add eggs and vanilla just until well mixed. 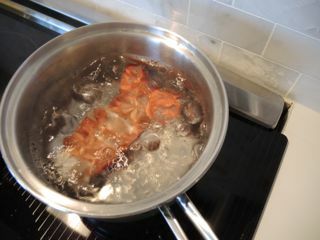 Remove 1 cup (250 ml) of batter and set aside. Pour remaining batter over cooled crust. 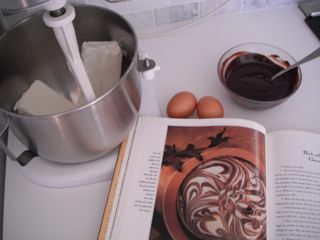 Stir warm chocolate into reserved batter. Drop by large spoonfuls onto the vanilla batter. 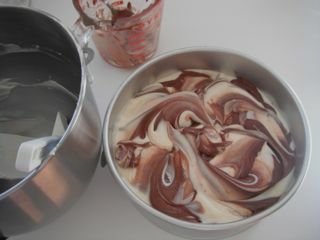 Using a clean spoon scoop down and up to slightly blend the two batters in a marbled pattern. Be careful not to over blend. Bake until slightly puffed around the edges, but still very soft in the center, 25-30 minutes. 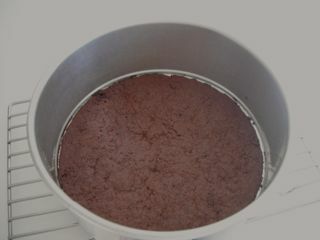 Remove from oven and carefully run a thin knife around the edges to release the cake from the sides of the pan. Cool on a rake covered by a large inverted bowl to prevent cracking. Once completely cooled cover and refrigerate. When ready to serve remove cheesecake from pan and carefully press reserved pastry crumbs around the sides of the cake.